CCG offers a variety of interactive attractions for children. The majority of attractions are included with the price of admission. For our three rides, tokens are $2 each or 6 tokens for $10. Proceeds from rides help maintain the Garden, the Garden Club’s Programs, and employ Camden youth. The majority of attractions are included with the price of admission. For our rides, tickets are $2.50 each or 5 tickets for $10. Each ride requires 1 ticket. Visitors can observe several species of butterflies in their 1,200 square foot home. A peaceful pond and bubbling fountain provide gentle background sounds as visitors experience butterflies flying, basking and nectaring in a lush tropical environment. This is a Garden carousel. It has a rabbit, a rooster, a pig, a cat, a shark and even a hummingbird! Children love to ride on the sea dragon. Of course there are several horses decorated with beautiful flowers and a bright red chariot. A red Apatosaurus (made from recycled car parts) is standing next to a waterfall, in a pool of water. A baby Hadrosaur, NJ's State Dinosaur, stands next to a dinosaur egg. Climb in and imagine what it was like to be a baby dinosaur! This exhibit features replicas of two house facades inspired by Camden, NJ row homes. The front yards demonstrate street “scaping” in a small space. In the backyards, each family has a different reason for gardening reflected in their own gardening style. You can climb the steps or walk up the ramp to enter the Tree House for a bird's eye view of the entire Garden. You might be able to spot butterflies, hawks, and migratory birds. It overlooks the Red Oak Run and the Peace Plaza. The 600' long Arrow River Train Ride holds up to 38 children or 22 adults. Have you ever seen an “underground maze”? This maze is designed to give you the feeling that you are tunneling underground. There are actually places where you have to crawl to get through the maze. There's even a small tot slide. Enter the Potting Shed to learn all about food. Inside you will find the exhibit, Food: From Farm to Family. Parents relax on a bench while children play in one of three areas in including the farm, the farm market, and the family kitchen. This Garden provides a space to exercise young muscles and opportunities for climbing, sliding and balancing activities. Visitors can crawl through or on top of the rock tunnel, walk along a balance beam, climb stairs, slide down the sliding board or hop on the log stepping stones. 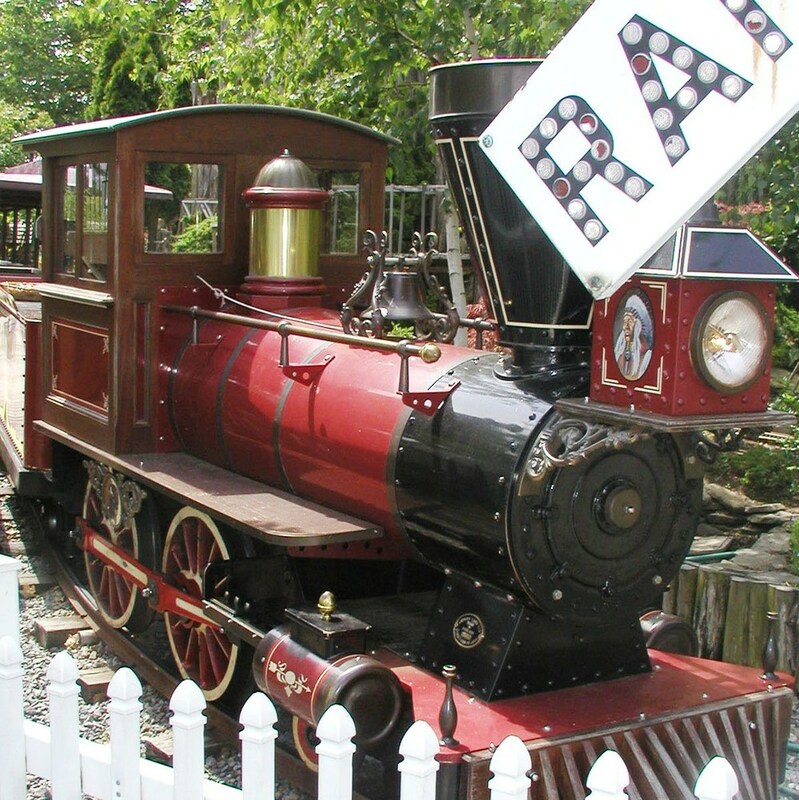 The Storybook Gardens invite children to interact with some of their favorite stories including The Three Little Pigs, A Giant’s Garden, The Frog Prince, and Alice in Wonderland!! Foods are being grown in over sized cups and bowls that are spread out on a red and white checked picnic blanket. On the corner of the blanket is a huge arbor in the shape of a picnic basket. There are giant ant sculptures marching right across the center of the blanket. Don’t miss the exciting Plaza de Aibonito, Puerto Rico tropical exhibit. You will find it past Ginkgo’s Gift Shop. This exhibit looks like the plaza in Aibonito, a beautiful town in Puerto Rico known as the “City of Flowers”. This special exhibit is open for guests to enjoy from June thru September. The Camden Children's Garden hosts special celebrations and events, offering additional activities and crafts related to the event theme. Standard admission rates apply. Some activities have a modest fee for materials (i.e. pumpkin painting). Main Plaza - Guests enter the Camden Children's Garden at the Main Plaza, offering an open space for gathering and people watching. Make a splash! 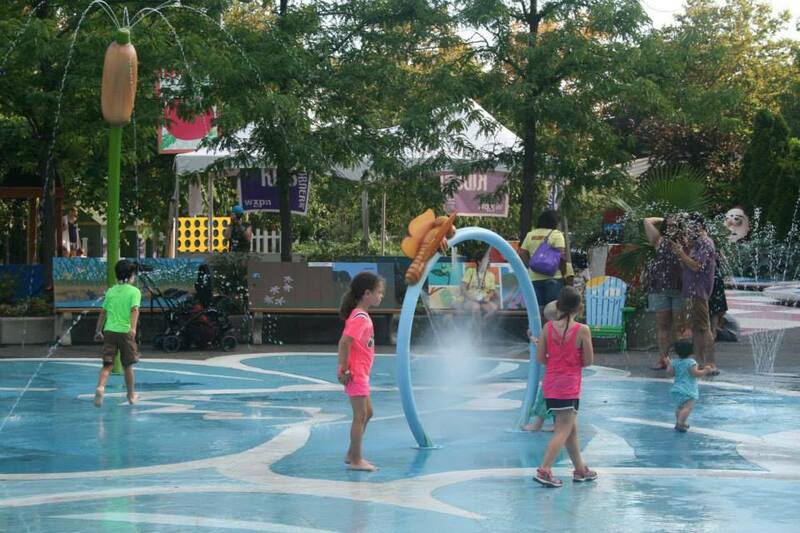 during the spring and summer months as the Main Plaza's Water Spray Ground comes alive creating a fun atmosphere. Guests are encouraged to bring bathing suits, water shoes, and towels. Surface may be slippery. Please provide adult supervision and NO RUNNING in the fountain area should be enforced. Surrounding the Plaza are shade trees and benches, creating comfortable resting spots for parents and chaperones. PLEASE NOTE: Water shoes, or socks should be worn. Running not permitted in fountain area. The fountains are open in the summer. Piney Woods Amphitheatre includes a seating area that can hold up to 140 visitors and several artists’ benches for additional seating. Guests are shaded by colorful yellow and blue umbrellas for protection from the sun. The stage area is set against a backdrop of pine trees. This area is used for a variety of programming such as entertainment and educational presentations. The Amphitheatre is also used for award ceremonies, wedding ceremonies and graduations for both daytime and evening rentals. Garden & Butterfly Tents - Tents are used to provide educational programming and can also be rented for parties, weddings, and other events. From April through October, tents are available for evening rentals. On chilly evenings, the sides can be installed for greater comfort. The Garden Tent can seat about 130 guests for dinner while the butterfly tent seats up to 30 guests. Larger functions are easily accommodated in buffet style or with serving stations located in colorful themed exhibits throughout the entire Garden. Ginkgo's Gift Shop - Make sure you save time to visit Ginkgo's Gift Shop. It's the Garden’s Gift Shop located right on Riverside Drive. Inside, you can find great gifts, including a line of Melissa & Doug Educational Products and Toys. The Gift Shop has a G-Scale Garden Railroad operating around the ceiling. It even has a replica of the Ben Franklin Bridge!